Let’s say you’ve bought some great items on the eBay from your pal, Jeff. First of all, would it have killed you to drive up the bidding a little bit? Those eBay fees can come down pretty hard. Secondly, when you get your package, chances are you’ll see something like what’s directly above. Or, perhaps, you might say something along the lines of “what the hell is this? !” Either way, it’s seen. And that’s all we can ask for. 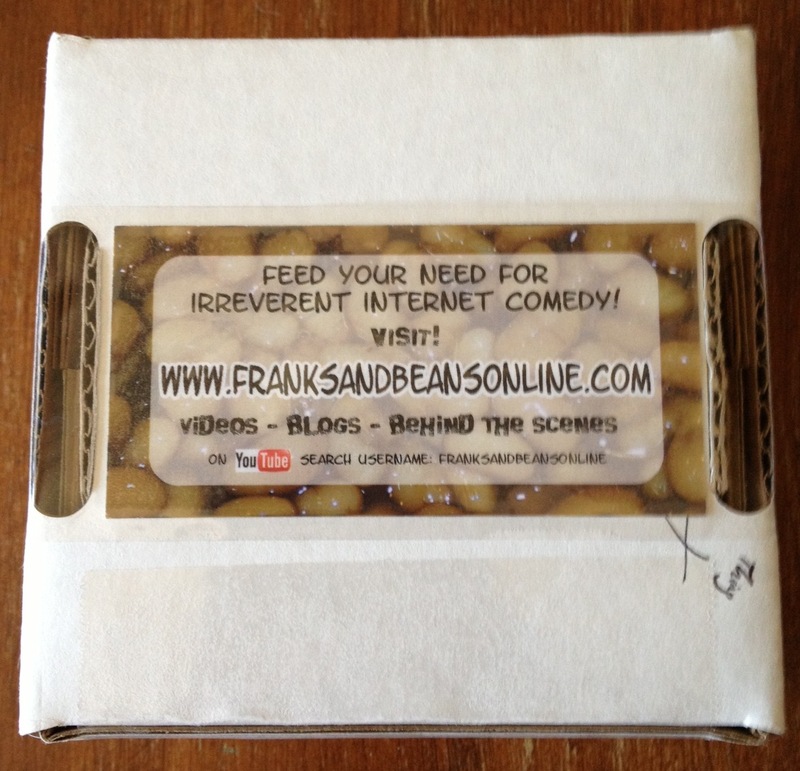 Our Franks and Beans business cards have been out for a while, and already they are collectors’ items. I say this because I’ve got like a thousand of them sitting in a box on a shelf, so I must be hoarding them for a reason. I foist them on others mostly at comic book conventions, when I have a semi-captive audience and when people are looking for anything that might be free. How much of an impact do these cards have? A little, I guess. After every convention, there’s a small spike in visitors to the site. Whether that’s from the convention bump or a sign of our impending fame is difficult to tell. I’m happy with them, though, and I guess that’s something. The front of the card is the F&B logo and there’s some information on the back, including the aforementioned baked beans background that we got by dumping out a can of baked beans on a plate and then taking a picture of them. And then eating the baked beans. 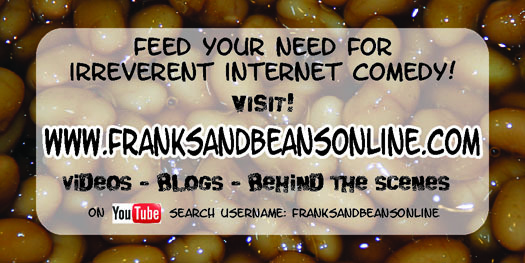 Below are the official Franks and Beans business card files. They were expertly printed at www.uprinting.com. Want to make your own? Knock yourself out! Hand them out to friends! Wallpaper your bathroom with them! Stick them to your Trapper Keeper! And as always, watch the mail. If ignorance is bliss, then how blissful do you feel after watching two men in their late 20s who apparently don’t know the alphabet offhand? Or, perhaps you think of our homophonic 31st episode, “Why?”, differently – maybe we’re just practicing it like monsters would. Wait, go back and read that last sentence again. Fifty bucks says you thought I wrote “homophobic”. Well, you should stop making such baseless accusations and stick to the task at hand. Why would I write such a thing? Insinuating that is getting pretty close to slander, my friend, so I’d watch myself if I were you – but I’m not, because I’m not a jerk. 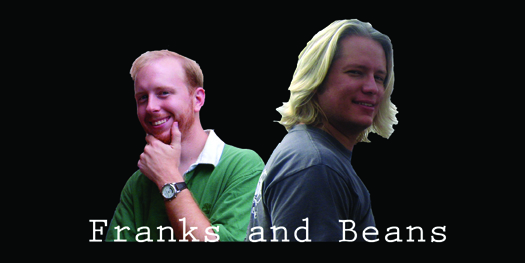 Consistency is something I strive for in Franks and Beans, not just in each individual episode, but series-wide. I doubt that I’m accomplishing all I set out to do, because things play out differently in the concept stage than they do when ideas become filmed reality, but I do think that I’m gaining some traction in this regard, and the last handful of episodes are a good example of this. While episode 31 might not be very long, it gets its point across as well or better than pretty much any episode to date, in my opinion, as its quick, catchy punch line hits all the right marks. As I see it, Franks and Beans has two typical jokes that it can tell – the episodic theme- and character-driven joke, and the quick, one-line, often physical joke that depends less on the people who present the joke than on the joke itself. Let’s compare two of our previous episodes, “High School”, our ostensive pilot, and “The Slip”, episode 20 or whatever. I don’t feel like looking up the exact episode number for that one – figure it out on your own, sheesh. In either case, the jokes revolve around subverting expectations, but the manner in which we get to that point make the episodes fall into one of two categories. In “High School”, regardless if you thought it was funny or not (you did, right?! ), it’s easy to see that the joke – and in both cases there is usually one central joke, just different ways or presenting it – depends on the setting, the new characters and the buildup to what is ultimately a moment of moral defeat for one character. In “The Slip”, the joke comes and goes in under a minute, and it all revolves around physical humor (not slipping on a banana peel…or getting punched in the face, depending on what version of the episode you watch). 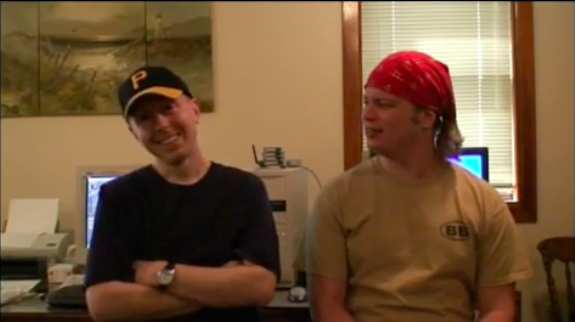 If Larry and I weren’t such good actors and so integral to the show, it wouldn’t matter who played the characters in “The Slip”, because the joke is paramount. “High School” plays things the other way around – the characters and the situation in this case are more than simply means to an end. Each situation gets us to a joke, but in different manners. This is the consistency I’m talking about, and the consistency I hope to achieve one day – if it is really an attainable goal. I want Franks and Beans to have this balance, where we don’t have too many character-driven episodes in a row and we don’t have too many joke-driven episodes in a row. I don’t know how we’re doing from a comprehensive perspective, but in the few episodes before and after #30, there’s a rare moment when everything seems to come together, like Halley’s comet or when you find an item that your REALLY want on eBay and the listing’s been misspelled (so…you know…you’re the only one who knows about it and can thus get it at a much cheaper price than you otherwise would…dammit, it’s not a perfect metaphor). “Why?” obviously falls into the second category, as this episode is certainly driven by the overall joke of mistaking a letter for a word by recreating a popular melodramatic cinematic (…hydromatic) moment. I’ve never seen anyone in real life fall to their knees and shout in agony to the heavens, but it’s been used so much in celluloid that it’s become a parody of itself in recent times. Having Larry move on to “Zee!” brings the light of recognition to this joke, and it’s one of my overall favorites because even though we’re shouting it at the screen, and even though it’s quite obvious what we’re going for, this happens to be one of the more ambiguous jokes we’ve told – much different from the usual slap-in-the-face variety that we often revert to (funny in its own right, to be sure). Having me go one step further and shout “Aaaaa!” heightens the overall mood – it would have been too quick to stop after just Larry’s bit. I also enjoy the acting done in this episode more than in others – and I’m referring to the moments we’re not falling to our knees and screaming in agony. I have the lingering suspicion that Franks and Beans would be twice as funny if Larry and I were better actors (for which I have no recourse other than to weep silently in bed at night), and this episode, where we actually do a halfway decent job at things, serves to do nothing but confirm those ideas. Perhaps it’s just because we don’t have many lines, but the lines we do have…wow! Look out. I do think we’re getting better, if that’s any solace. Our “No!” ending this episode might seem a little strange, and not just because Larry is standing on his head. Seriously, do his legs look really skinny to anyone else? Do you think standing on your head would alter the appearance – other than the obvious – so drastically? Maybe I’ve just never taken the time to stare at Larry’s legs before. I doubt I’ll start now, so I’m left with only one recourse – believing that Larry’s legs are wiry and brittle. But no, that’s not what strikes me as weird with this episode’s requisite ending. After we spend most of the proper episode shouting single words in an exclamatory fashion, we have this – a sequence where Larry shouts a monosyllabic word in an exclamatory fashion. It seems fairly repetitive. I suppose that’s okay, but it just sticks out to me every time I watch it. I suppose that’s what happens when you have such disconnect between scenes in the episode, but that’s the theme we’re going for, and I’m happy with it, especially since it’s taken 31 episodes before it happened. Our monstrously spectacular 23rd episode, “eBay”, harkens back to a previous episode, but it is its format that brings me to this equally monstrously spectacular blog. I suppose the monstrous spectacular-ity may vary depending on your preferences, though…just take my word for it. If you’ve seen the episode “Message Board”, then you’ve probably figured out that there are more than a few similarities between it and “eBay”. For starters, my character spends most of his time discovering a new and potentially dangerous function for the Internet. In addition, in both episodes I eventually get caught up in some of the more obvious pitfalls of said Internet tools, as Larry tries to warn me of the errors I’m committing. I think that this episode, much like episode 11, can be and is still funny even though the two are quite similar because of how common the situations are. Everyone who has haplessly wandered onto a message board can understand how overly dramatic a seemingly harmless situation can become, just as anyone worth his or her virtual salt has seen firsthand how an Internet auction can get out of control. Bidding wars are nothing new, as I’m sure face-to-face auctions hold the same dangerous tendencies where some get caught up in the moment (I once outbid my high school science teacher on a box of random Star Trek paraphernalia…really), but the vendettas that spring out of an eBay auction are at the same time horrible and hilarious. The shared experience with the creators and viewers is what makes this episode work, which hopefully it does. What really strikes me as interesting about this episode, though, is the format and how it compares to the standard episode of Franks and Beans. “eBay”, clocking in at a little under five minutes in length, is one of our longer episodes. However, it was one of the quickest to shoot, and I think that Larry will agree that it was one of the easiest to edit, as we basically have a steady-camera shot of a few difference scenes that were filmed in basic sequential order. The speed in which the episode was completed happened for a couple reasons – first, Larry and I were wrapping up a day in which we had spent a lot of time filming for other episodes, and I was anxious to leave (but not because I don’t like Larry. Why do people keep insinuating that?!). Second, and more important, we didn’t use much of a hard-and-fast script. Not that we usually spend our time memorizing written lines, but in this case we really just dove head first into the episode relying on a lot of improvisation. And just like in “Message Board”, it seemed to go off without a hitch. Once the final product was up and ready for viewing, I noticed the length and it struck me as, for lack of a better term, odd. As anyone who pulls up the F&B playlist (thousands and thousands of you) can readily see, the average length of our episodes might be, what, two minutes? Two and a half? And this is with more preparation, more writing, and more filming than this episode, usually by a lot. What makes it so hard for me to write four minutes of dialogue, when Larry and I can randomly rattle off as much if not more without breaking much of a sweat? This is something that I can’t wrap myself around quite yet – all the preparation that goes into a ‘regular’ episode (and there is preparation…I promise) and we come up with something twice as long by just turning the camera on and going with it. Naturally, a longer episode doesn’t necessarily mean a better episode…but I think you know what I mean. This also leads me to think about more ‘conventional’ sitcoms, the 22-minute, broadcast-ready television sitcoms. “eBay” is, roughly, one-fifth the length of your average CBS sitcom when you discount commercials. If this one conversation about how easy it is to get sucked into spending too much money on eBay took up 20 percent of, say, as episode of “How I Met Your Mother” (or any other in that generic lineup), how does anything get done in your typical program? How do they not run out of time after the third scene? I can’t figure this one out – it took us four and a half minutes to tell ONE JOKE – and they’re expected to turn out complex characters and interesting situations in not all that much more time. Amazing. A few more random notes about this episode before I wrap things up for this blog: At the beginning of the episode I make a call to a fictional toy shop (there aren’t many around anymore, to be honest) and ask for a “Rhinox” action figure. This is because I will do anything in my power to talk about the show “Beast Wars” with Larry, as it’s one thing we can agree on – “Beast Wars” was a great show. Tremendous. And Rhinox was the best character on the Transformers spin-off, though Larry may not agree with that. But I’m right. As we were filming, I actually did type “Rhinox” into eBay’s search function, and what do you know – there was a new Rhinox figure on the market. A few weeks later Larry bought it and mailed it to me – because that’s just the kind of guy he is. The kind of guy who mails stuff to you. Thanks, buddy! One of the most frustratingly deceptive actions on eBay is the scheme of charging too much on shipping costs. Hey, there’s something I want and it’s ONLY 99 CENTS! YES! I WILL BUY IT AND – oh, wait, it costs 30 dollars to send a book…through MEDIA MAIL. You only have to let your guard down for one second and bam! They get you. I hate people who do this. Our much anticipated “NO!” ending was, honestly, a thing of desperation. For the life of me, I couldn’t think of a good twist on our little tradition, and let’s face it – Larry wasn’t coming up with any pieces of gold either. Finally I said, “oh, just put your clothes on backwards or something” and we went with it. Just before we shot the dubious scene, though, Larry said, probably as an aside, “do you want me to walk in backwards when I do it?” BRILLIANCE! This is what made the ending. I was just going to have Larry walk in as always, only with his pants on backwards (shirt and hat, too, but “pants” is a funny word and I didn’t want to take away from that). And it would have been awful. But having Larry walk in backwards, stick his arms behind him and give ‘em that Larryesque shake did wonders for it and for our ending.